He also helped create the concept for the Baltimore Ravens’ trio of mascots: Edgar, Allan, & Poe. For four years, Bromley performed as the original Edgar, and was even selected as a NFL Pro-Bowl mascot. He performed at Superbowl XXXV in Tampa, Florida, and cheered on the Ravens during their championship victory. He started this career of mascotting while attending film school at The American University in Washington, DC, where he performed as their eagle mascot “Clawed!” Bromley was recognized as one the nation’s top 10 college mascots by the Universal Cheerleaders Association. 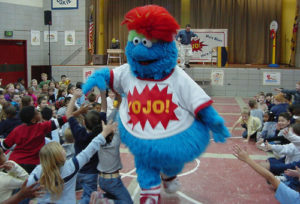 In 1999, the idea of YoJo started to form as Bromley wanted to create his own independent mascot that would be more than just a sideshow at sporting events. 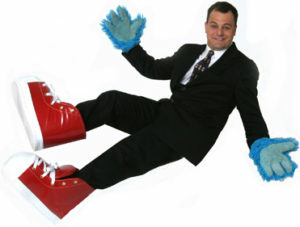 The thought was to combine his very animated mascotting skills with extra talent and enhanced production qualities. This dream finally became a full reality when the first show debuted at Beltsville Elementary, the school where his wife was a teacher, in March of 2000. 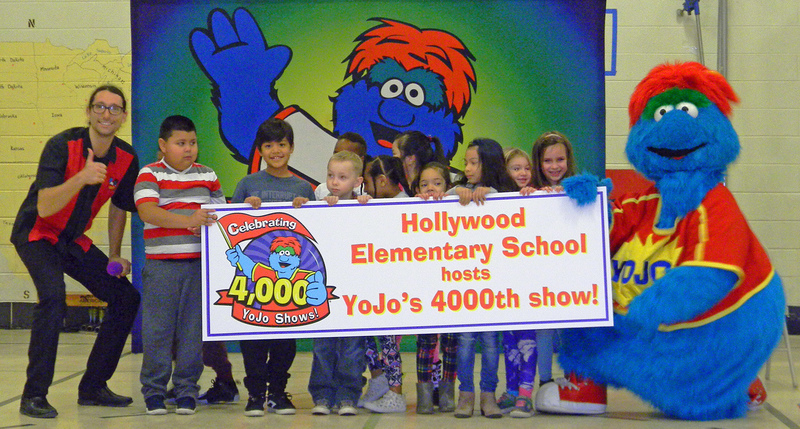 After a few successful years, YoJo’s shows became so popular and frequent that Bromley dedicated himself to producing and performing YoJo as his full-time occupation in October of 2004. He currently lives in Hanover, Maryland and is married to Leslie, who is the principal of Beltsville Academy. They have a son, Bromley III, and a daughter, Cameron, who both just happen to share the same sense of humor as their dad. Bromley is seen posing with his grand championship trophy after running Ben Moore Half-Marathon in Annapolis, Maryland. The trophy, however, has nothing to do with the race. In fact, it was taken from an abandoned and foreclosed property. But hey – it does make a nice photo. WJZ-TV’s “Morning Edition” in Baltimore. This online video is embedded via YouTube.